Today's LOAD513 prompt was "Why?" Just simply that. It made me think of two pictures I recently printed of my daughter's playing school together. It is really sweet to hear them play this but they play it in the middle of the hallway! I have no idea why but it seems to work for them even though it inconveniences the rest of us. Oh well... it's worth it. "You two like to play Miss Sunny School. I understand why you like to play - Sadie gets to be a teacher (complete with written out lesson plans sometimes), Ashlyn gets to try out going to school, and you can play it together peacefully. What I don't understand is WHY you have to play it in the hallway! Sometimes it seems as if you both empty your entire rooms into the hall! No one can pass through if class is in session. I love you girls but sometimes... :)"
The pictures are hard to see here on the computer but I know when my kids look at them, they will know exactly what they are. The papers here are from We R Memory Keepers, the Show & Tell Story Time line. The font is Cricut's Pooh Font. 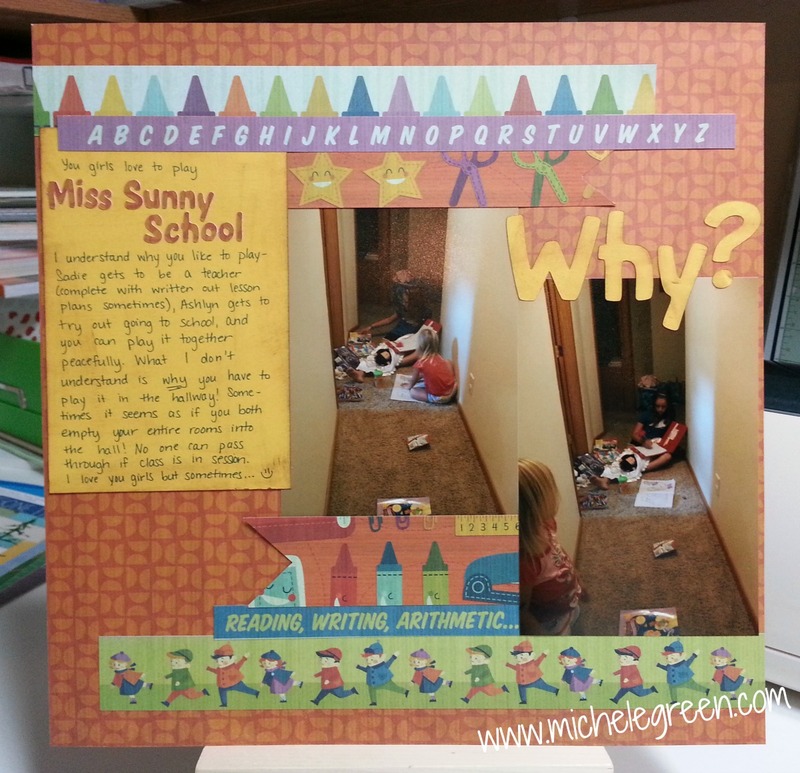 Why is 3.5" and Miss Sunny School is 0.5". One week in and I've managed a layout every day! Phew! Should have known Miss Sunny school would make the page one of these days! Keep up the good work!